In spite of the fast growth of laser-based powder additive manufacturing processes as a part of everyday industrial practice, achieving consistent production is hampered by the scarce repeatability of performance that is often encountered across different additive manufacturing (AM) machines. In addition, the development of novel feedstock materials, which is fundamental to the future growth of AM, is limited by the absence of established methodologies for their successful exploitation. This dissertation will be devoted to develops a structured procedure with a complete test plan, which defines step-by-step the standardized actions that should be taken to characterize and to optimize the processing parameters and scanning strategy in powder bed fusion (PBF) and direct energy deposition (DED) of new alloy grades. We need experimental and statistically treated results of optimization of laser processing regimes and characterization of the microstructure and mechanical properties of new grades of powder alloys for the AM of the PBF and the DED methods. Master Students will develop a holistic comparative methodology, which take into account consideration all the laser/material interactions in different local geometries of the build, and suggests, for each possible interaction, a specific geometry for test specimens, standard energy parameters to be analyzed through a design of experiment, and measurable key performance indicators. The proposed procedure, therefore, represents a sound and robust aid to the development of novel alloy grades for the PBF and the DED and to the definition of the most appropriate processing conditions for them in comparison, independent of the specific AM machine applied. Statistic treatment of experimental measurements (ANOVA approach). Design for Additive manufacturing (DfAM) approach. Finite Element Analysis (FEA) of thermo-mechanical properties for fabricated 3D parts. Preparation of technical reports and scientific articles. We need experimental and statistically treated results of the thermo-mechanical properties for the 3D printed SMPs in the region between the glass and melt temperatures. These data will be combined with macro- and microstructural estimates.3D printed material orientation under isothermal conditions (at temperatures below the melting temperature) is realized by using a tensile testing machine, Instron series, equipped with a temperature chamber. Each specimen will fix into the machine grips and subjected to a constant displacement-rate tensile test run. Viscous elastic-plastic behaviour of material must show character hysteresis loop. A dynamic mechanical analysis (DMA) of the SMP will be performed. Master Students will develop simulation methods in ABAQUS environment to describing a temperature field distribution, a degree of crystallinity, a residual stress-strain state, prediction of mechanical properties of the material with the SME after FDM fabrication. Understand the mechanical behaviour of polymer structures. Understand the structural features of the FDM process. Create complex 3D finite element models of polymer parts and structures by means of ABAQUS FEA software. Measurement of the high-temperature melt pool region in the laser powder bed fusion (LPBF) process is a primary focus of researchers to further understand the dynamic physics of the heating, melting, adhesion, and cooling which define this commercially popular additive manufacturing process. To convert a measured camera signal into a true temperature, the surface emissivity must be known. There are multiple methods for measuring emissivity and details several methods for calculating emissivity measurement uncertainty. We need to provide calibrated, well-characterized temperature data to support simulation and modelling research, and to acquire high-speed, high-fidelity observations and measurements to support the development of in-situ monitoring and feedback control.Master student will detail the design, execution, and results of high speed, high magnification in-situ thermographic measurements focusing on the melt pool region of the LPBF process. Knowing the approximate size of different isotherms around the melt pool will help determine the required magnification, and heating/cooling rates determine the required frame rate and integration time to temporally resolve these phenomena. Further work will relate these thermographic results to process finite element simulation of temperature distribution and improvement of in-situ sensing and control methodologies. Finite Element Analysis (FEA) of temperature distribution during the SLM process. During the SLM process, high heating and cooling rates generally cause inhomogeneous thermal distribution, induce heterogeneous thermal expansions and contractions, and inevitably result in serious thermal and residual stresses. Experimental methods to characterize residual stress in 3D printed specimens could be very complicated. The curvature method measures the deflection or curvature of a cantilever part caused by residual stresses, reflecting thermal stresses within layers. Therefore, this method is more suitable for 3D printed components, because SLM is based on the melting of successive layers, and the variation of processing parameters (such as scanning strategy, layer thickness, preheating, etc.) has a significant effect on residual stresses. We need experimental SLM fabrication of the cantilever structure on a substrate which will later be designed and evaluated into ABAQUS the FEM model. At the two ends of the cantilever arms, the additional supporting body must adapt to stand deformation. The bars will print with different scanning strategies, like X, Y and XY cross scanning strategies (scanning direction of 900 alternated among layers). The other group of cantilever specimens will be creating with the same XY cross scanning strategy, but for various bar thicknesses. To detect this difference, the comb-shaped supports were cut off from the substrate, and the cantilever bent towards the Z direction (building direction) due to the residual stress release. To probe the possible methods to release residual stress, low-temperature annealing as a relatively economical method will be considered. A thermal-mechanical coupled analysis model consisting of a cantilever and substrate will be developed by ABAQUS software. The moving direction and velocity of the heat flux will be controlled by a subroutine, and elements will be activated step by step sequentially as the heat flux moved (“birth and death” technique). 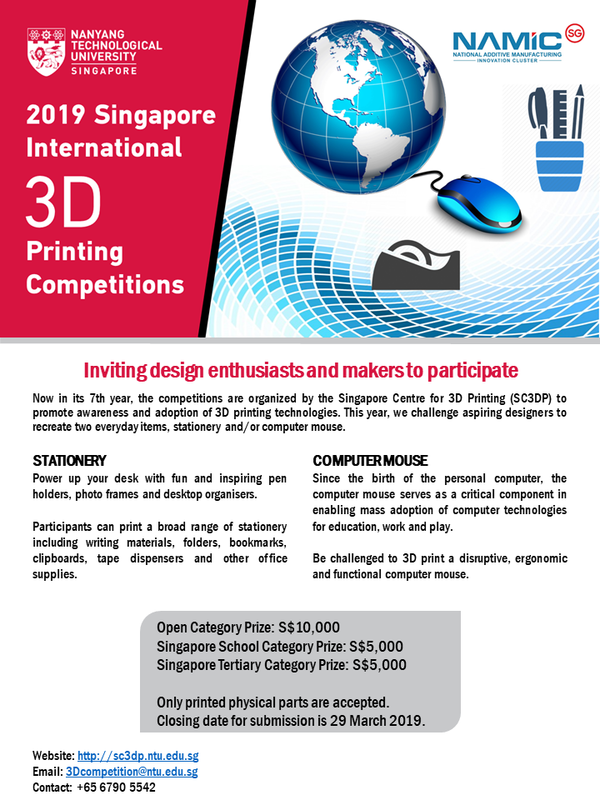 the 3D Printing Competitions between students around the world. Original solutions of stationary or computer items are welcome. Full close loop cycle of design and manufacturing for innovation item is aim of this MsD project.Remark : Every year the direction of competition is changed ! Function representation is becoming a popular technique for design of complex 3D models. It allows designers to get a compact description of a sophisticated shape. Function representation was used for modeling of biostructures such as bones or vascular trees, lattices with various porosity, foams with vary elasticity. All these models were printed by additive manufacturing. But it is a challenging task to conduct an analysis of models in function representation.The main goal of this project is to implement a moment-vector approach to parametric and topology optimization of models in function representation. This approach is a meshfree method for performing stress, strain and elasticity analysis. It was already applied for different types of model representations. It works well for boundary representation, constructive solid geometry, voxels and G-Code. The goal is to study this technique and to adopt it for function representation. The work in this project requires understanding of 3D modeling techniques in different representation such as boundary representation, constructive solid geometry, voxel representation. The statements of physical analytical problems for solids, approaches for their theoretical and numerical solution. Programming skills in Matlab, Python, C++ or similar environments are required. By the end of this project students will have acquired understanding of the state-of-the-art in 3D modeling and solid analysis problems, will learn numerical and analytical tools that are being currently used to explore physical properties of solids, and become experienced in the development of analytical task and numerical implementation of their solutions. ▪  Pasko, A., Adzhiev, V., Sourin, A. & Savchenko, V., 1995. Function representation in geometric modeling: concepts, implementation and applications. The Visual Computer, 11(8), p. 429–446. ▪  Martínez, J., Dumas, J. & Lefebvre, S., 2016. Procedural Voronoi Foams for Additive Manufacturing. ACM Transactions on Graphics (TOG), 35(4). ▪  Taber, A., Kumar, G., Freytag, M. & Shapiro, V., 2018. A moment-vector approach to interoperable analysis. Computer-Aided Design, Volume 102, pp. 139-147. Project description as a separate document with technical details. Optimization task appears in many fields as design, economic, decision making. There can be just one optimization parameter or it can be multidimensional (multi-parameter) case. In the design that is quite common to face an optimization task for shape recovery. Researchers are trying to fit parametrized or free shape models to data samples such as 3D scans. In both mentioned cases one has a deal with multidimensional optimization. To rich a good quality of approximation it is important to find global optima of the objective function with good accuracy.One of the possible solution of this task is to combine stochastic techniques with classic approaches having a good convergence. One of the possible combination is a simultaneous applying of simulated annealing and Newton-Raphson method. The project goal is to investigate the efficiency of this hybrid approach for optimization task and the shape recovery task in particular. The work in this project requires theoretical understanding of algorithms and numerical programming, their realization. Programming skills in Matlab, Python, C++ or similar languages are required. By the end of this project students will have acquired understanding of the state-of-the-art in optimization, will learn numerical and analytical tools that are being currently used to solve optimization problems, and become experienced in model development and numerical implementation. ▪  Fayolle, P.A. & Pasko, A., 2016. An evolutionary approach to the extraction of object construction trees from 3D point clouds. Computer-Aided Design, Volume 74, pp. 1-17. ▪  Marker J., Braude I., Museth K., Breen D., 2006. Contour-Based Surface Reconstruction using Implicit Curve Fitting, and Distance Field Filtering and Interpolation. Volume Graphics. Volume 2006, pp. 1-9. Highcycle fatigue and gigacycle fatigue are the most dangerous types of loading leading to failure of structures and catastrophes. This problem is of special importance in aircraft industry where the reliability of an aircraft depends on fatigue characterization of materials. The major part of the project is related to experimental studies of fatigue in metals. Experimental studies will include sample design and preparation, fatigue experiments, microscopy, post-processing results in MatLab or another software. By the end of this project students will have acquired understanding of the state-of-the-art in fatigue phenomena, will learn concurrent experimental approaches, and become experienced in conducting mechanical experiments. Composite materials have superior properties relative to metals and their application is of primary importance in aerospace industry. Delaminations represent the most dangerous damage mode for unidirectional fiber-reinforced polymer composites. There are several state-of-the-art approaches to improve interlaminar fracture toughness, some of them are concurrently developed in industry. The project is related to experimental comparison and characterization of these approaches for static and fatigue loadings. Experimental studies will include sample preparation, static and fatigue experiments, microscopy, post-processing of results. By the end of this project students will have acquired understanding of the state-of-the-art in mechanics of fiber-reinforced polymer composites, will learn concurrent experimental approaches, and become experienced in conducting mechanical experiments. Big structures like a blade of a windmill or an aircraft wing are manufactured by liquid composite molding. The manufacturing of a real structure is supported typically by numerical analysis of impregnation of a dry preform with resin. The key parameter in this analysis is the tensor of permeability. Our team has participated in three international benchmarks on the subject, developed a unique experimental test-bed, and now continues research in this direction. The project is related to experimental studies of permeability of composite preforms. Experimental studies will include test-bed assembly, sample preparation, permeability experiments, post-processing of results. By the end of this project students will have acquired understanding of the state-of-the-art in permeability studies of materials, will learn concurrent experimental approaches, and become experienced in conducting experiments. Thermal-barrier coatings play a key role in the industry where thermal insulation is required, including gas turbine and aero-engine parts. Unique thermal insulation properties are provided by complex microstructure of the material. The project proposes microscopic studies of 3D pore microstructure. Experimental studies will include sample preparation, microscopy, post-processing of results. By the end of this project students will have acquired understanding of the state-of-the-art in thermal-barrier coatings, will learn concurrent experimental approaches, and become experienced in conducting experiments. Industry 4.0 requires advanced digital approaches in modelling materials behavior. Examples include digital twins of composite and nanocomposite materials. There is a variability of mechanical, electrical, and thermal digital twins currently on demand in industry. Several topics may be proposed. Studies include finite-element modeling of composite materials. Knowledge on mechanics of materials. Experience with finite-element modeling. Coding (e.g. in Python). By the end of this project students will have acquired understanding of the state-of-the-art in finite-element modelling, will learn concurrent numerical approaches, and become experienced in modeling. Nanoindentation is a technique to determine mechanical properties of a material on micro-level. Project proposes experimental studies for different types of materials with anisotropic or heterogeneous microstructure. Knowledge on mechanics of materials. By the end of this project students will have acquired understanding of the state-of-the-art in nanoindentation, will learn concurrent experimental approaches, and become experienced in conducting experiments. The project aims at studying wave propagation in materials with complex microstructure. Knowledge on mechanics of materials. Experimental studies will include sample preparation, acoustic wave registration, and results post-processing. By the end of this project students will have acquired understanding of the state-of-the-art in wave propagation, will learn concurrent experimental approaches, and become experienced in conducting experiments. Nanocomposites have become key materials in many applications due to their unique mechanical and functional properties. Several topics may be proposed for research studies, including mechanical, electrical, and thermal applications. Knowledge on mechanics of materials or material science. Experience with nanocomposites. Experimental studies will include samples preparation, measurements of mechanical, electrical, or thermal material properties, and results post-processing. By the end of this project students will have acquired understanding of the state-of-the-art in nanocomposites, will learn concurrent experimental approaches, and become experienced in conducting experiments.